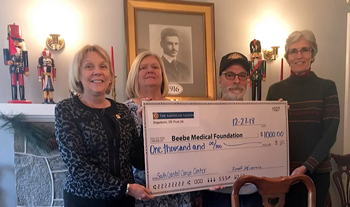 American Legion Post 24 in Dagsboro recently presented the Beebe Medical Foundation with a generous gift of $1,000 for the I Believe in Beebe campaign in support of Beebe Healthcare’s expansion projects in the South Coastal area of Sussex County. Beebe’s Creating the Next Generation of Care projects include a freestanding emergency department and second cancer center, which are under construction on Route 17 near Millville. Shown (left to right) are Beebe Medical Foundation President Judy Aliquo, Post 24 Auxiliary President Donna Difrancis, Post 24 Adjutant Ron Difrancis, and Beebe Medical Foundation Gift Planning Officer Diane Barlow. To learn more about Beebe Medical Foundation and how you can donate, call (302) 644-2900, email foundation@beebehealthcare.org or go to www.beebemedicalfoundation.org. All donations to Beebe Healthcare, your not-for-profit community healthcare system are tax-deductible through Beebe Medical Foundation.